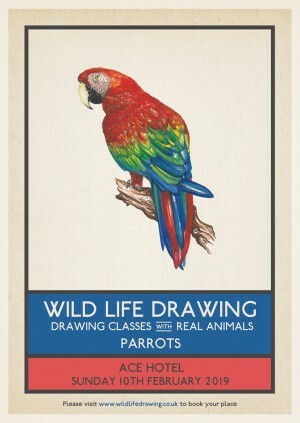 Delighted to announce a day of drawing classes with colourful parrots on the top floor of Ace Hotel this February. We'll be meeting and drawing four vividly colourful Macaws – Scarlet, Blue & Gold, Blue Throated and a Hyacinth Macaw. These beautiful birds will be accompanied by one of the UK's leading parrot experts, who works to boost populations of rare and endangered species in the wild. We will learn all about these colourful and charismatic birds; their intelligence and ability to talk, their lives in the wild and the many conservation issues affecting the birds in rainforests across the world. Wild Life Drawing is working with the finest animal handlers, sanctuaries and organisations to put on these events. All the animals that attend the sessions are well used to humans and different environments and are always accompanied by experienced handlers, their welfare is our highest priority. Barrett Watson is one of the most distinguished parrot experts in the UK and he provides a vast amount of educational information for responsible parrot ownership, campaigns against wing-clipping and is a published author on the species. This class is slightly more expensive than usual as Barrett and his parrots don't come cheap! *Species attending the session are subject to change as only happy and healthy parrots are brought along.